Keeping our coordination with the advancements taking place in the industry, we are involved in providing services via a variety of Cable Supply, Laying , Connection And Earthing Service Service. Demanded and appreciated due to their reliability these presented services are provided in accordance with the evolutions of this economical market. Over the years, we have gained immense credibility across different domestic and international markets in offering Power Cable Laying Work. Our service is highly appreciated and demanded in various places. We have a huge team of workers who are skilled and experienced in their own way. Further, our professionals assure that the offered services will be completed within the specified time frame. WorkForce provides the excellent concepts of underground cabling, through Duct banks and Cable trenches and direct buried cables, we offer the most reliable and efficient HT/EHV XLPE cables from leading manufacturer in the world. WorkForce is well equipped with tools and machinery required to execute the projects, as per approved standard procedures. With the use of progressive tools, machinery and techniques, we are immersed in presenting to our customers highly unbeatable LT Cable Laying services. Known for their flexibility, reliability and exactness, these offered services are highly demanded and recommended. In addition to this, these could be availed from us at highly inexpensive rates within the promised frame of time. cable laying services will be provided with fully automatic machine upto 10T pulling force. cable laying rates will be depends on site conditions. Being one of the leading organizations, we are engaged in providing a commendable range of Electrical Cable Laying Services. We put forth our most efficient team to carry out cable laying and excavation works for voltages in the range from 440 volts till 22 kV under ground cable laying. Laying and fitting of the single core, multi-core, armoured, unarmouredHT & LT cables, erection of transformers, and other electrical equipment installations. - Analysis for all types of vessels with all kinds of design parameters. 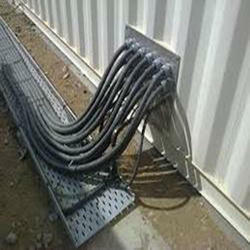 Undergrounding is the replacement of overhead cables providing electrical power or ... Underground cables can transmit power across densely populated or areas where ... The UK regulator Office of Gas and Electricity Markets (OFGEM) permits transmission companies to recoup the cost of some undergrounding. Parth Electricals & Engineering Pvt. Ltd.
less technology or mirco tunnelling ) and laying of Optical Fibre Cable using .... execution of trenching contracts, project authorities may classify the soil in the more .... services laid close to BSNL cables, it is essential to take ...... Following are the major observations/tests to be conducted during Acceptance testing of OFC by. 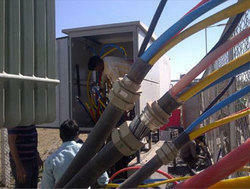 We have established ourselves as coveted organization, involved in rendering Cable Laying Work. Our supplying, installation, testing & commissioning of HT & LT cable laying are done at competitive price. These are applicable in diverse industries and provides efficient performance for long time. Harness Belt, Fandisender, Airpiston, Crass Mate, Jackram & anything hanging.